The seven deadly sins are the origin for the title of this new game of the Polish publisher WOLF FANG. 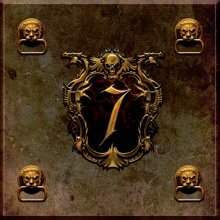 The title itself is unusually short for a game, it is only 7 - not as a word, it is only the number. Not exactly something you would call an attention getter, if you would ask me. In spite of that the game caught my eye at the convention in Essen. The reason for this was the remarkable artwork of the whole game. Beginning with the box and ending with the cards the game is truly a masterwork of graphical design. Agniszka Bala, the graphical designer, has made a great job. When you are holding the gamebox in your hand, the first impression of a noble game is still reinforced, since it is a substantially hard box that would withstand one or two falls. After opening the box, you will love the beautiful painted cards and boards of heroes, potions, treasures, inns, temples and so on. The quality of the cards however tempers delight slightly, because they are too thin to weather out a lot of playing without getting damaged. Perhaps a revised version should come with stronger cards. I guess that WOLF FANG already takes action, because they gave you stronger hero cards as a gift if you bought a copy of the game at the SPIEL convention. 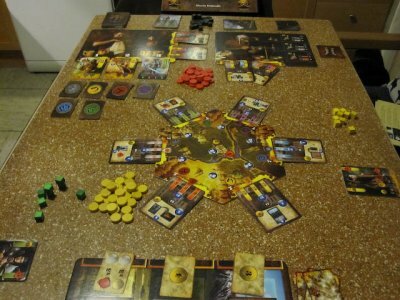 The gameplay adopts a typical fantasy game theme. The players start as small heroes who try to improve their powers by getting artifacts, buying potions, recruiting followers and setting influence in temples, castles and estates. Of course all this costs either money or fame and other resources and so you also can find a production phase, in which you earn those important resources with the help of your followers and your influences in the buildings. And so, after a while, the heroes get stronger and stronger. If a player feels strong enough, he may take part in an adventure. This sounds more difficult than it is actually. There are always six different adventures with several tasks available on the gameboard. To fulfill a task of an adventure the player only has to pay a specific amount of valuables to succeed. When all tasks of the two adventures in the row at the bottom are completed a scoring for those adventures takes place. Players who have solved most of the tasks get a higher profit of the treasure of the adventure. The treasures are valuables or specific artifacts the players can use in later rounds for buying things or solving the next tasks of a different adventure. Also, the players can find parts of a legendary armor, an armor they need to win the game. So, in reality the basic rules of 7 are no more than a simple resource management game, although the setting is somewhat unusual. You must get the right resources, money or valuables from your followers and buildings to buy new potions, attract followers and get influence in buildings and for taking part in the adventures. All this is quite traditional and does not let an experienced gamer´s heart beat really faster. However, you sometimes have the feeling that you are really part of the battle against the hideous overlord in spite of the easy game mechanism. I suppose this is mainly the result of the excellent and atmospheric graphical design again. Don´t get me wrong, the game works quite fine and will satisfy a lot of people, but I still wonder a bit why the game won over the players in a few of my testing rounds in spite of the very simple game mechanics. One reason here might be the "Sin"-cards which are a somewhat exciting element. These cards support the deep atmosphere of the fantasy theme and of course they are the reason for the title of the game. At the beginning of each round every player has three of these cards in his hand. Again the extraordinary artwork of this cards stands out of the mass of other games. Every card shows one of the seven sins, represented by a beautiful, a little bit revealing lady. In a turn, a player may play one or more of these cards to his benefit. At the end of each round however, the player must draw new Sin-cards , until he possesses three cards again. Whenever the seventh card is played on the discarding pile, a disaster takes place. The result is often a close-down of specific places (e.g. one of the market stalls, where you can get potions) or some buildings or heroes has to be put out of the game. So it is always a hard conflict, if you should play one of the cards or if you should not. In the basic variant of the game all players share the same aim. Together they try to compose the seven parts of the legendary armor. If all parts are found by the players the game is won by the mightiest player, i.e the one with the best followers and most influence. There is another way to win the game. 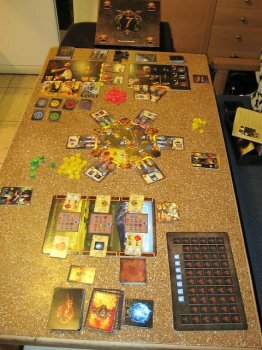 If the players are able to close all six portals on the game board, the one who has closed most of these portals wins the game. Portals are closed with the help of seven resources of the same type. But there is also a chance that all players loose the game. After the 14th disaster has taken place, the game ends after the current round. If the players are not able to win the game in the one or other way at that point, the game is lost and the dark side takes over. One of the included expansion rules brings another very interesting element into the game. In this variant at the end of a round all players must take a card of defeat for every sin card they have not played in the round before. As soon as a player has taken his seventh card of defeat, he changes to the dark side and then tries to prevent the other players to win the game. He then wins the game, if the 14th disaster has lead to a defeat of all the other players. But there is also a chance for such a player to change sides once again. Especially with more people this variant is a very interesting one due to the conflict of interest. Let us have a closer look to the rules and the balance of the game. As in the former games of WOLF FANG the German rules (I do not posses any other) are hard to understand in parts. Admittedly the language is much better than in the last games, but still it is sometimes hard to conclude what the writer wants to tell us. Probably this is mainly because the rules sometimes use different words for the same game elements. I think more examples or a short introduction would solve this problem and make the rules much better. The balance of the game seemed to be very sophisticated in my first tries. Especially at the beginning the players must make hard efforts to get stronger and get enough influence. In the middle of the game, the Sin-cards become more and more important. The players must find a wise balance between using the benefits and drifting from one disaster to the other. Then, in the end game the chances to win the game must be considered attentively. This worked well at the beginning, but when I did a two player game I found myself in an oversupply of fame, influence and resources from the middle of the game on. This is the reason why I would suggest only to play the game with more than two players. The game leaves me a little bit puzzled. On the one hand I really loved playing it and I admired the excellent artwork. On the other hand - despite of the positive feedback which came also from my friends - I am quite sure, that 7 will not find its way on my table all too often. The game is truly worth its money, especially if you are captivated by its artwork. Still, you should be a fantasy fan and perhaps a closer look into the rules (on the homepage of WOLF FANG) before a purchase would be no fault. The game mechanism is nothing you would call cutting-edge, and so you should like the traditional and easy way of collecting and spending resources in the game to get new and better cards again.